These are the cards I made for Christmas thank-yous. I wanted to keep it simple but still kinda nice, know what I mean? So I decided an embossing folder and a cut out shape would be perfect. CAS and awesome!!! Love the embossing folder and that great big sentiment! What a perfect, simple design! I really like this a lot! What a fabulous CAS card Gail! Love it! Thanks for stopping by my blog. I'm hoping that your family will all feel better soon! Such a pretty card today!! Love the embossing and great diecut title. Oooohhhh Gale, I love these!!! Beautiful! 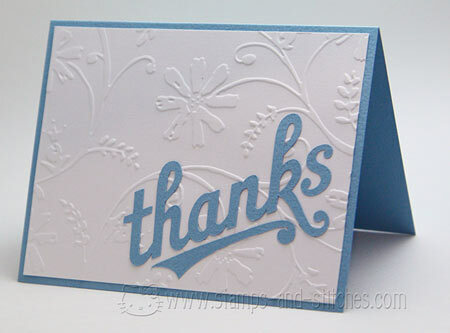 I really like the soft blue on the white embossed background.